This past weekend Alex and I participated in the annual “Paws on Parade” walk-a-thon to raise funds for our local pet therapy organization, Paws with a Purpose. 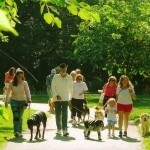 The event is held in a park that has a lovely trail winding through the trees, next to the river, and always attracts a good turnout of dogs and their humans. As we parked and got out of the car, I could see that Alex was not eager to join the assembled group, so instead of his usual flexi-leash, I put his slip lead on, as he’s been known to try to back out of his collar if spooked by something. I allowed him plenty of time to check out the scene and the other dogs, though he clearly did not want to be part of the party! As the walk got underway, we were joined by a group of children from a local agency that offers residential and other counseling services for children in the foster system. The pet therapy dogs serve this agency with visits to teach “life skills” such as respect, teamwork, and personal responsibility, and have been a very popular and effective addition to the curriculum. 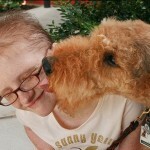 Cute Dog Contest=Cute Fundraising Idea! I am always looking for fun (and easy) fund-raising ideas for animal organizations. Actually, this idea could be used for any organization, not just animal-related. It’s from the Delta Society. The class project – ‘help others’. Each student in the 5th grade class was given the assignment – find a way to help others. The children were to work independently, not with other classmates, to come up with their own way to make a difference in other’s lives. 11-year old Alyssa decided she wanted to help bring more joy, compassion and comfort to others through the Delta Society Pet Partners program, and she decided to raise money to support this program. She contacted Delta for promotional materials for use during her fundraiser, including coloring sheets for kids, informational pamphlets for adults and a banner. At that time she wasn’t sure what her project would actually be – maybe a bake sale. But she came up with a very creative idea. She mounted the dogs’ pictures on a board, and next to each dog there was a number. There were 18 cups with lids near the poster. If you wanted to vote for one of the dogs you would look at the number next to it and put a coin in the cup with that number. The amounts of the votes were the amounts of the coins, for example a quarter would be twenty five votes. The contest went on for two weeks. The winner of the contest got a huge gift basket with toys and snacks, and the runner-ups received smaller gift baskets with two items. The fundraiser raised $424.29! I love this story because it shows that small donations add up and make a difference. Congratulations, Alyssa! “Molly the Miracle” continues to astound her doctors who agree her recovery is amazing. Her red blood cell count is holding strong at 38! She is eating and playing and enjoying life as a normal dog. 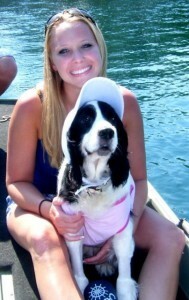 She loves going for walks and riding in the car, and even takes boat rides! If you look closely at her front legs you can see that she’s had to endure numerous IV’s, but her wonderful spirit and the love of her foster parents and caregivers helped to pull her through. Recently she was guest of honor at a “Yappy Hour” party held in St. Petersburg to help raise funds for her medical care — can’t you just see the sparkle in her eyes and the happiness in her pretty face! Thanks to everyone who has followed her medical miracle story as she fought for her life, and had a hand in helping this little girl find such a happy life! Although my children are of the canine persuasion, I have always loved Mother’s Day. Spring is in full bloom and it ushers in the lovely month of May. Since moving back to be closer to my elderly parents (mom is 94) I have especially treasured each Mother’s Day. Today, we will celebrate it at our mountain cabin, though it will be a bit chilly to enjoy the deck. But Mother will settle herself in front of the fireplace with a glass of sherry, and all will be right with the world. They say “the apple doesn’t fall far from the tree.” I owe my love of all creatures to both my parents, but especially my mother. One Sunday on our way to church she spotted a collie by the road. On our way home the collie was still there, so Mother stopped the car and coaxed her in. After diligent attempts to find her owner, Sheba became part of our family and spanned my childhood from about age 5 to age 14. 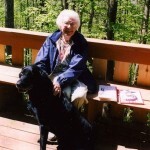 The night she died, I was at a school dance, and it wasn’t until many years later I learned that Sheba had gone into acute heart failure and my father had euthanized her with morphine from his doctor bag. My sisters and I thought she had died in her sleep. The next dog, Sherry, saw us through our teenage years and helped Mother adjust to the empty nest as one by one, we left for college. When Sherry died, my parents never got another dog, but they enjoy visits from my dogs at their retirement community. Once, when I left Byron there for a brief time, I returned to find Byron and Mother sitting on the couch, watching a concert on TV. “He’s a high brow dog,” she pronounced. “He loves classical music.” One year my father bought me a pot of daisies with a card from Byron and Emily, for Mother’s Day. I treasured that gift, and saved the card. And when Byron, and then Emily, died, my parents mourned with me. This Mother’s Day, my brood consists of Alex, my welsh springer who will be two next month. Most of the puppy craziness is gone (sigh!) but he has become a lovely companion, following me everywhere as Springers do. I will burst with pride as he shows off his repertoire of tricks, “high five” and “high ten,” and I will make sure there is a good supply of treats in everyone’s pockets. Happy Mother’s Day to all the mothers of the world, and may your children bring you much joy. Posted in Adventures of Alex, Uncategorized | Comments Off on Happy Mother’s Day! During Be Kind to Animals week, the American Humane Organization honors children and teens who are making a difference for shelter animals. Congratulations to Asheville’s own Janis Brehler, a 10 year old who volunteers several days per week at the Asheville Humane Society, socializing the pets and helping the shelter staff with a variety of tasks. Janis is a runner-up in this national contest! Read about Janis and the other winners here. What an inspiring group of young people making a difference for shelter animals!